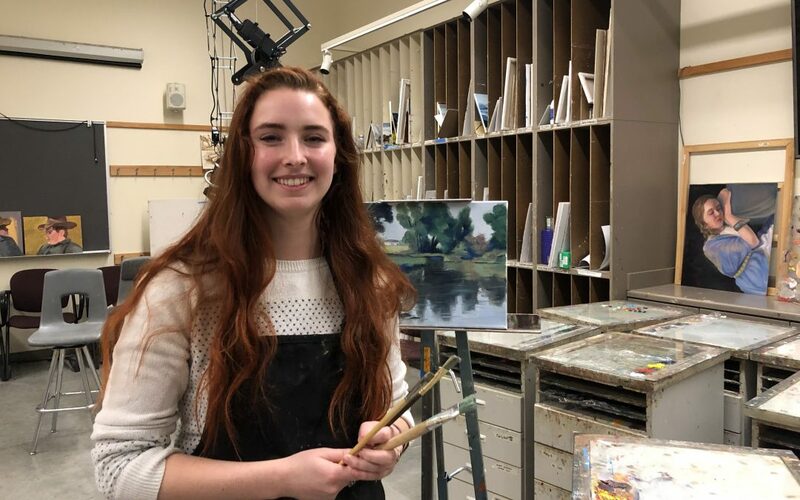 Dasha Berringer, a junior studying art, began painting in high school after her parents bought her a set of oil paints. She loves aesthetic cinematography and is an oil painter. Berringer explained that she is drawn to art because, unlike other creative mediums, art allows her to create a visual that can portray a concept or idea. “The BYU-Idaho Department of Art provides an aesthetic, conceptual and technical foundation in the visual arts for students who possess a wide range of interests, experiences, and abilities. We prepare students for professional careers, graduate school and facilitate personal enrichment and lifelong learning,” according to the BYU-Idaho website. Students majoring in art have the option to choose from the following emphases: art education, art history, book arts, ceramics, drawing, graphic design, illustration, painting, photography, printmaking and sculpture. There are currently thirty-eight faculty members and approximately 1,300 major students in the art program. According to Berringer, the art work that is created at BYU-Idaho is on par with work from major art institutions. Berringer explains that there is a lot of prep work that needs to go into the sketch book before painting will start. The students in the BYU-I art program create beautiful, aesthetic pieces of work which can be viewed in the Spori Art Gallery and throughout the Jacob Spori building.